If you were going to invent the perfect perennial, it would have to meet an exacting list of requirements. It would have to be very beautiful, hardy, easy to care for, and practically indestructible. You'd also want it to increase annually and to thrive in a wide range of conditions, including light shade. You'd want deer, rodents, and insects to ignore it. Fortunately for gardeners, that ideal perennial already exists. 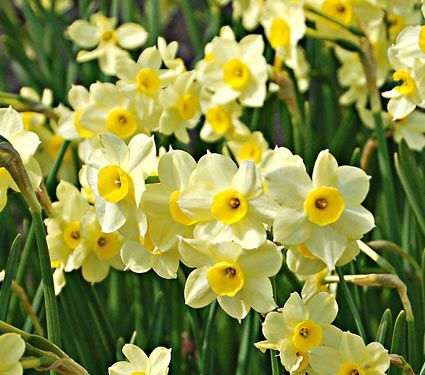 Botanically, it's known as Narcissus, but it's more familiar to most as the Daffodil. These are the most classic of flowers. 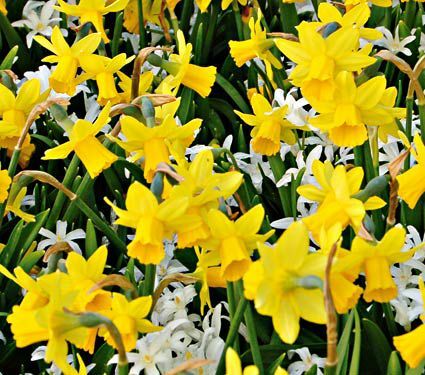 Trumpets are the best Daffodils for bedding, with a single big, bold flower per stem. They generally perform better in the middle and northern states than in the Deep South. Most have gray-green foilage, 1/2-1" wide. 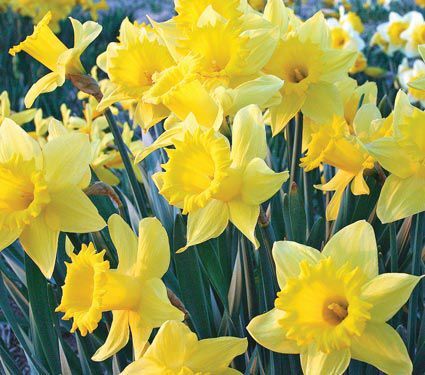 A Daffodil is officially classified as a Trumpet when the trumpet, or corona, is as long as or longer than the outer petals. 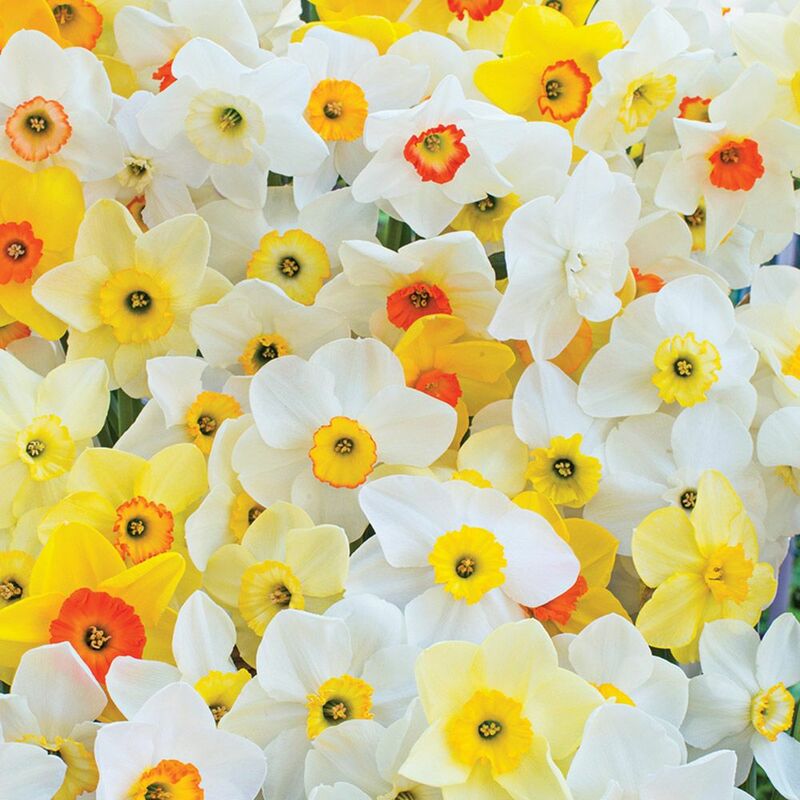 These are the workhorses of the Daffodil world because they're good for every possible use: bedding, picking, naturalizing, forcing, and showing. This class includes the full color range: white, every shade of yellow, orange, red, and pink. One flower to a stem. 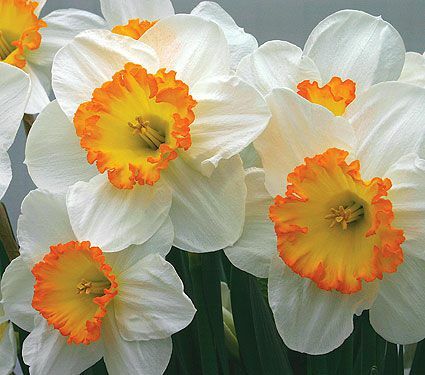 Instead of a trumpet, these Daffodils have a central cluster of petals and are almost Rose-like in form. Doubles have from 1 to as many as 20 flowers per stem and are good for show, bedding, and picking. This group likes hot, baking summer sun. It is well adapted to the Deep South but also thrives in cooler parts of the country. Bulbs naturalize well, creating beautiful sweeps of color. Several small, fragrant flowers per stem are held above narrow, grasslike, dark green leaves. 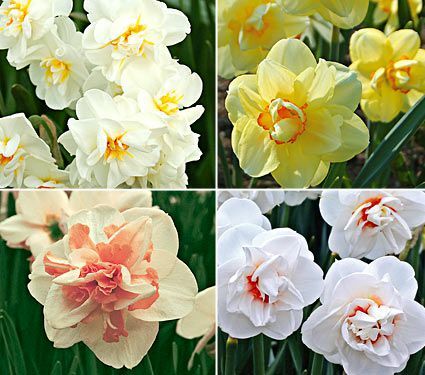 This group includes every form of Daffodil flower in a petite package, usually 6" or shorter. These little bulbs are excellent for rock gardens, the front of the border, niches between tree roots, and forcing. They are also beautiful in patio containers if protected from freezing north of Zone 7. 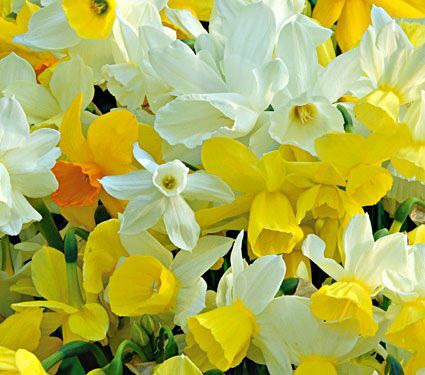 Bulbs vary in size, but all are the largest grade available and produce 2 or more flower stems per bulb. 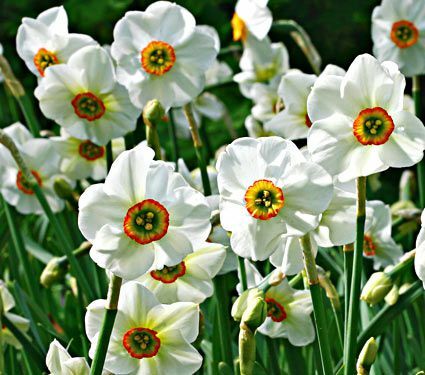 These radiant Daffodils have large white petals similar in appearance to those of the Flowering Dogwood, with a very small, red-rimmed cup and a spicy fragrance. 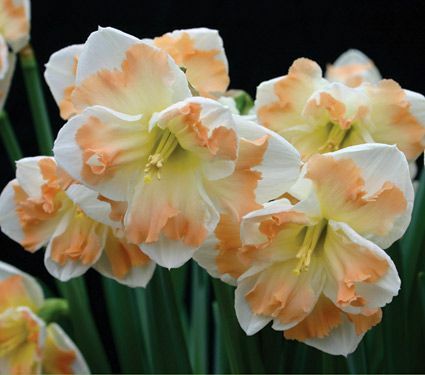 The Poet's Daffodils are among the very last narcissus to flower, providing a perfumed finale to the Daffodil season. Best suited to cooler parts of the country, the Poeticus are excellent for naturalizing and for borders. They're also terrific for bouquets. Many are heirlooms. Crips, brilliant colors characterize this group of long-lived perennials. 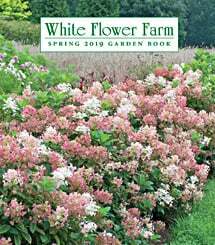 They are great for naturalizing and contribute rich color to a mixed border in spring. Flowers are also wonderful for cutting. Each stem bears a single flower. The cup is not more than one-third the length of the outer petals. These are unusual flowers, quite unlike most Daffodils. The cup is split for at least one-half its length, creating an open face instead of the typical trumpet. Many of the flowers look more like a Hibiscus than they do a Daffodil. One of the showiest groups for mass plantings in the landscape, these large, up-facing blossoms provide more color for the dollar. 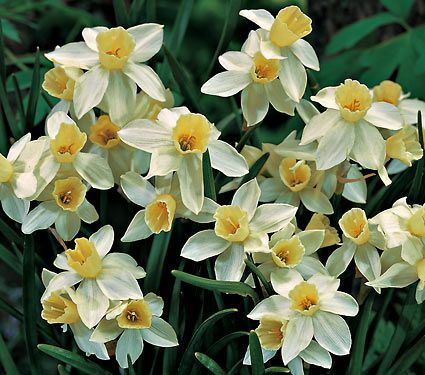 These Daffodils have many small flowers per stem and emit a musky sweet fragrance. They are particularly good for the Deep South. Tazettas are excellent perennializers and are also good for forcing, bedding, and picking for bouquets. Triandrus Daffodils have two or more nodding, Fuchsia-like blossoms per stem. The outer petals are gently swept back. All have a delicious fruity fragrance. Great for bedding, rock gardens, or cutting.